The Insignia of the Society shall consist of a badge of gold, pendant from a ribbon. Said badge shall be in the form of a Maltese cross (emblematic of faith in the justice of our cause), between four (4) golden eagles (symbolizing the four sections – north, south, east and west of our common country), and resting upon an anchor of gold (representative of the American navy, by which so many glorious victories of the War of 1812 were achieved). The arms of the cross to be enameled in scarlet with a white border and to bear the insignia, in gold, of the four (4) arms of service (infantry, cavalry, artillery and naval), and in the center thereof a medallion of dark blue enamel, with the figures 1812 thereon in gold, surrounded by a band of black enamel, bearing eighteen (18) stars in gold representing the number of States of the Union during the period of conflict. The reverse of said insignia to bear in the center of the cross a wreath of oak leaves in gold, one-half inch in diameter, surrounded by rays, and in conformity with the design submitted to the General Society. The anchor and cross to be suspended from the ribbon by a ring of gold. The ribbon shall be of watered silk, dark blue in the centre, with white and black stripes on the sides successively, and edged with scarlet; the entire ribbon to be one and one-half inches in width and the same dimensions in displayed length. The insignia shall be worn by members of the Society at all general meetings and other occasion of ceremony or when they shall assemble for any stated purpose or celebration. On other occasions than those specified above, members may wear a rosette of the prescribed ribbon and pattern in the upper buttonhole of the left lapel of the coat. The insignia shall never be worn as an article of jewelry or ornament, and on expulsion or resignation of a member shall be returned to the General Society, but upon the death of a member in good standing it shall be deemed an heirloom. The insignia shall be worn at the left breast by members of the Society, but the Executive Committee may make rules as to a distinct manner of wearing the same by officers of the General Society, Past Presidents General and Presidents and Past Presidents of the State Societies. 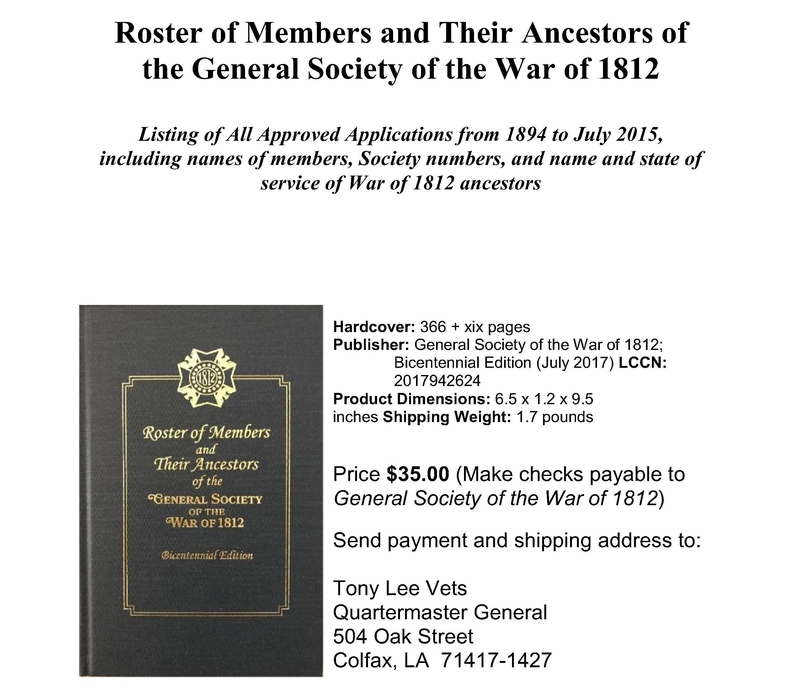 The custodian of the insignia shall be the Quartermaster General who shall issue the same to members of the State Societies under such rules as may be formulated by the General Society. The Seal of the Society shall be two and one-half inches in diameter, and shall consist of an eagle displayed in the center of the seal, holding in his talons the American flag of the period (of fifteen stars), with rays of a rising sun above, and wreaths of oak and laurel (emblematic of the valor and victory of our soldiers and sailors), with trophies of cannon, musket, sword and anchor, below. The motto of the Society, “For Our Country’s Rights,” to be placed above the sun’s rays in small Roman capital letters, and the whole to be encircled with a ribbon one-fourth of an inch wide, bearing, in plain Roman capital letters, the legend, “General Society of the War of 1812. Founded 1814.” The seal is to be in conformity with the design submitted to the General Society. The Secretary General shall be the Custodian of the seal, which shall be used only for the purposes designated by the Society.